Just when I thought I had this old tool habit kicked, via the ATC, I happened upon a Craig’s List ad for an old Craftsman miter box for $18. (Ok, so I guess I hadn’t totally kicked it as I was searching CL for miter boxes at the time… and if I type in “ww” into my web browser address bar, the first thing to come up is “www.ebay.com”.) The box itself didn’t catch my attention (right away), but the crisp handle on the backsaw that came with it did. After the wife and son went down for their afternoon naps, I made a quick phone call and got some driving instructions, hopped into the car, and drove 45 minutes to see a man about a box. When I got there, it was everything I’d hoped it was, so I gave the elderly man a twenty dollar bill and made my way back home. In the basement, I extracted the saw from the miter box and gave it a quick look-over. As previously mentioned, the tote was in near perfect shape, structurally. It didn’t have so much as a chip or crack to speak of. But it was covered in grease and oil and only some of the original film finish. It was a Disston, and the medallion came from the 1896-1917 era. The shape of the tote backs up the medallion, so it all appears to be original. The only physical fault is that it was missing one half of one of the saw nuts (the slotted half). It wasn’t broken; just missing. The 14″ backsaw has about 3 1/2″ of depth left under the back, so there is plenty of life left in it. I’m in the process of cleaning it up; I’ll post more pictures when it is done. I set the saw aside and turned my attention to the miter box. As the plate in the front says, it is a Craftsman 3646 Miter Box. Apparently my Google-Fu is rusty, because I couldn’t find much at all on this model on the interwebz. 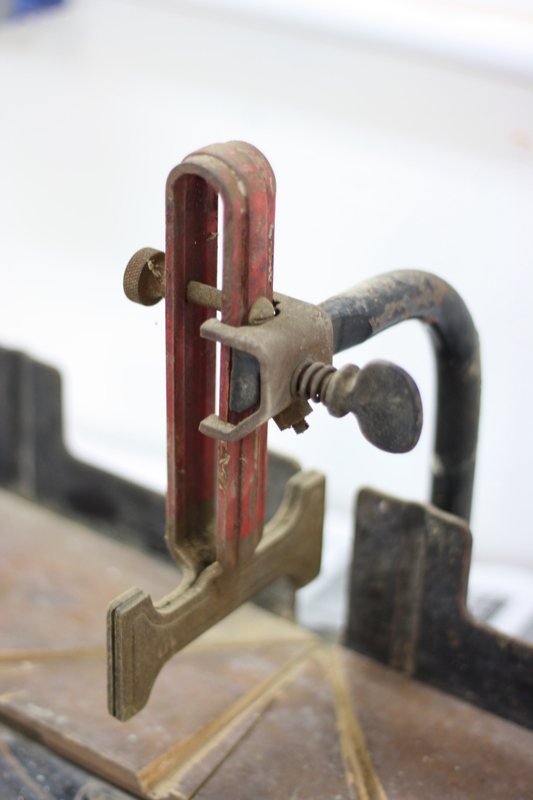 It is similar in style to the Stanley 150 in that it guides the saw by clamping the blade into position. Height is adjusted by loosening the bracket at the end of the clamp arm and raising or lowering the clamping mechanism. I have two miter boxes in the basement already, so one wonders why I needed a third one. I’ll tell you. The first one, a Stanley 358A, is the one I currently use. 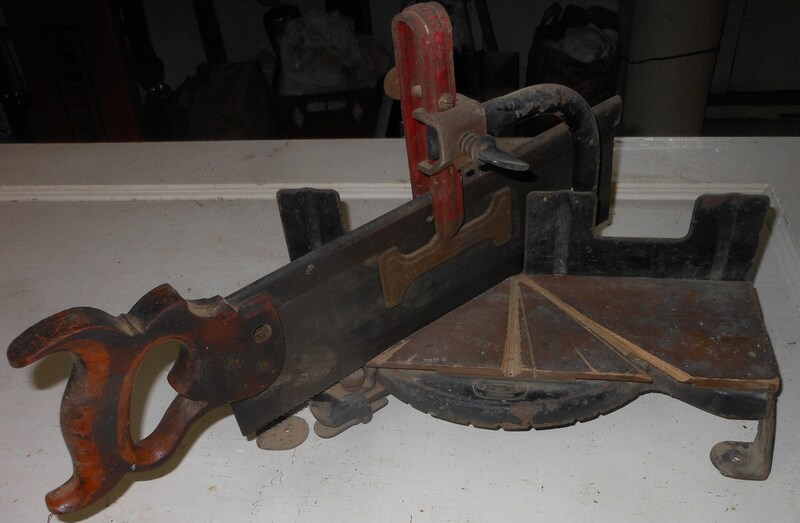 It is in OK condition and the saw is sharp. But it is somewhat newer (per the tote shape and medallion – I should look those up for a specific range some time) and not the most pleasing to my discerning eye (so I’m a tool snob; sue me). The other is a Millers Falls Langdon Acme Miter Box, Size 2, No. 73, with the original saw with a nice apple wood tote. That’s more my style, but it needs some restoration work before I can put it to use. My biggest hang-up with these two boxes is the hydraulic mechanism that maintains the saw height. I just don’t know what I should or shouldn’t do to clean them up and make them run more smoothly, and they both need work on this specific part. My solution to this is a non-selfish one. Our local woodworking guild is always looking for new mini workshop ideas – things that just a few guild members can do on a Saturday and/or Sunday at a minimal cost. 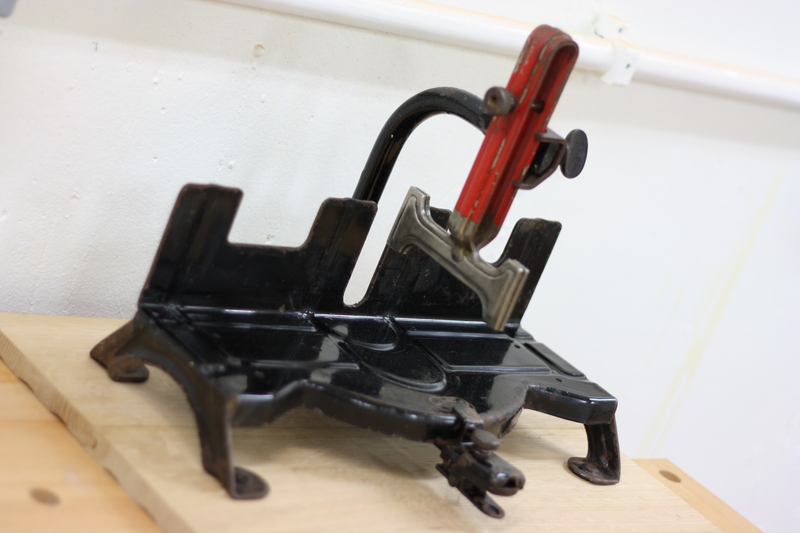 I figured I could donate the Stanley to the guild workshop for everyone to use and see if one of the guild members would be willing to teach a mini workshop on restoring that style of miter box. Surely there are a few guild members who have one of these that could use some tuning up! Anyway, when I saw a miter box that was styled more like the old Stanley 150, I thought it might be a chance to get a miter box on the cheap that I could fix up on my own and put right to work. After I removed the sacrificial deck and gave it a quick once-over, I realized it really wasn’t in bad condition. Originally, I’d been thinking I would have to have it sandblasted to bare metal and then repaint it. But it had more than 85% of the japanning left on it, so I felt a gentle cleaning would be the prudent choice. I grabbed a cardboard flat (really, the lid to a paper box from work) and started taking pictures and dismantling the miter box, putting any small pieces in the flat. After it was mostly broken down (I left the arm that holds the saw guide attached because it worked smoothly – why mess with a good thing? ), I soaked everything in degreaser and attacked it with green Scotchbright pads. Then I took a wire wheel to the bare metal parts to remove difficult grime and rust. Finally, it all (bare metal and japanned metal) got a nice coat of Renaissance Wax before re-assembly. Enter Mark Harrell, owner of Bad Axe Tool Works. Mark is going to put together for me a vrry nice 20” Bad Axe miter saw. And, since I have discerning tool tastes and a flair for the dramatic, I have a little surprise for the tote. I don’t want to say more now, so I guess you’ll just have to wait and see. I will guarantee it is something you’ve not seen before, but I think it will look nice. ← A Polissoir Poulet No More! This happens to me all the time. If nothing else, when a new tool follows me home, it now comes with good reason. At least rational thought behind it. OK, maybe just because it was shiny! Unfortunately, the stuff I bring home is rarely shiny. It is rusty, covered in the grime and grease and dirt and oil of a hundred years of work. I suspect it is the same for you. You’re almost there, though. It’s not because the object is shiny; it is because the object has SHINY POTENTIAL. Sometimes I bring things home to clean up, not because I want them, but because the potential for that item to be great is so obvious and the price is so cheap and maybe I can give it to someone who might put it back to work. I grew up in a 12-Step family. My mom would call my behavior some twisted form of codependency, I’m sure. I should also mention that you can find amazing things when you dismantle something completely (or mostly completely) and examine every part in detail. For instance, at first glance, I thought the angle set mechanism was a piece of junk! Then I realized it was just completely mucked up with crap. Once I took it all apart, scrubbed and then wire wheeled the pin that locks the plate into place, and waxed it all up and re-assembled it, it works amazingly well. That is probably the one part of this gentle rehab I wish I could share more fully with everyone. It was such a great feeling to take something that seemed like it was broken, it worked so poorly, and make it work like it is brand new. Great article! I’ve come across two of these: One Craftsman box just like yours, and an identical model from Millers Falls. I think these Steel models are more durable than the cast-iron-based Stanley No. 150 models. I didn’t see a photo from the rear of your miter box. 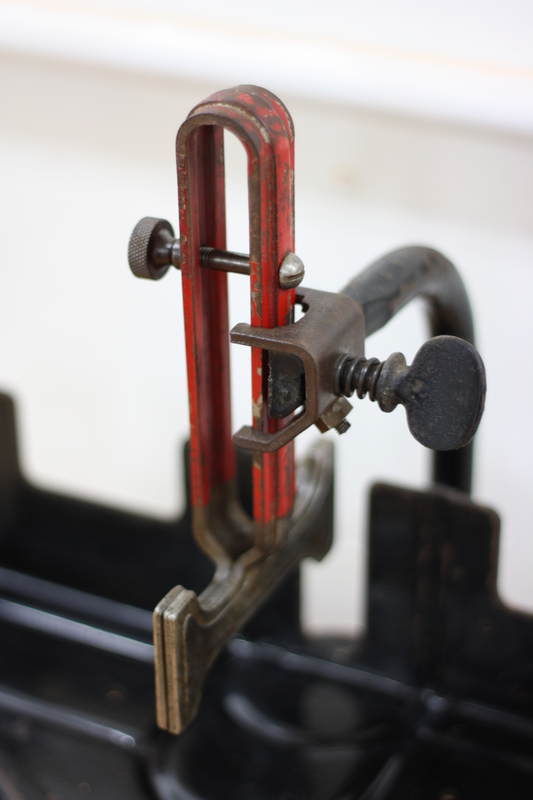 There should be a fat pin through the vertical part of the pivot-arm, which provides a mounting place for a little wood wheel, just like the Stanley 150’s have to keep the miter-saw from dipping too low. One of my Craftsman boxes had this pin broken off. I was able to drill & tap a 10-32 bolt into that broken pin, to mount a wooden wheel. Enjoy! You came across them… Did you buy both of them?? So far, it’s one sweet miter box. I love the simplicity of it and I love how portable it is. If you can’t tell in the pictures, I mounted it to two scraps of solid white oak flooring a friend of mine gave me. 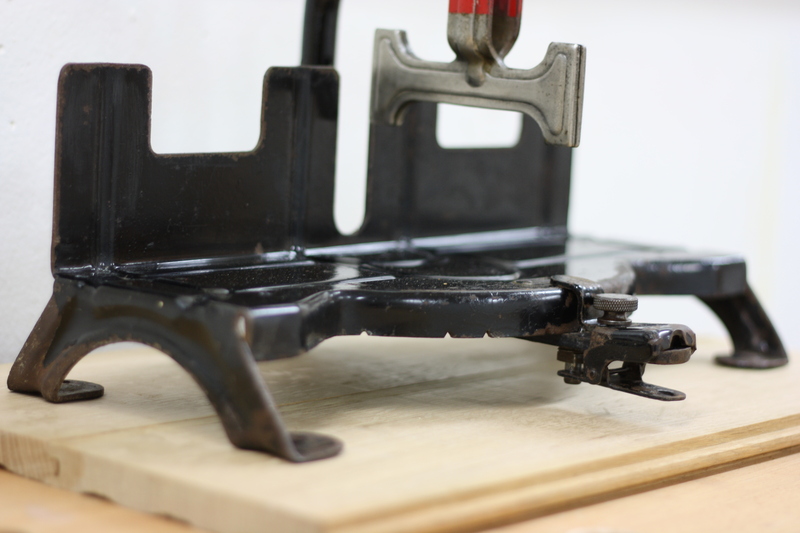 It’s so easy to set it on my workbench and clamp it down and start sawing away. Yep, I do have a little wooden wheel back there, though it is mostly sawn through at this point. I’ve been trying to figure out the best way to replace it because, as you indicated, it doesn’t appear the pin can be removed. 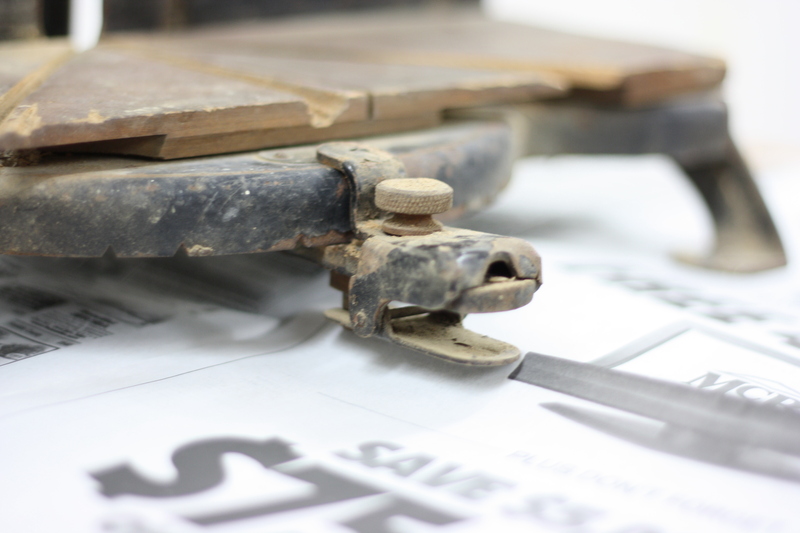 I was thinking about gluing up a little square of wood, sawing it in half and regluing it together with newsprint in between, then marking center on the glue line and making a small circle/wheel of wood I can then split again and glue around the pin after removing the old one. Thoughts? I forgot also to mention — the fully-equipped box has a spring in the little ‘jaws’ that you grip when you swing the arm around for different angles. That spring will help you easily access the Detent notches for 0/45/etc angles. It’s pretty easy to find a small coil-spring that will fit in there (I’m guessing like 3/8″ diameter and pushing out to about 1-1/4″ long). Enjoy! Yes, I can send some pic’s. My ‘OEM’ spring was the one that was sold, but I’ve got a decent reproduction for the other box, via a variety box of springs I got.